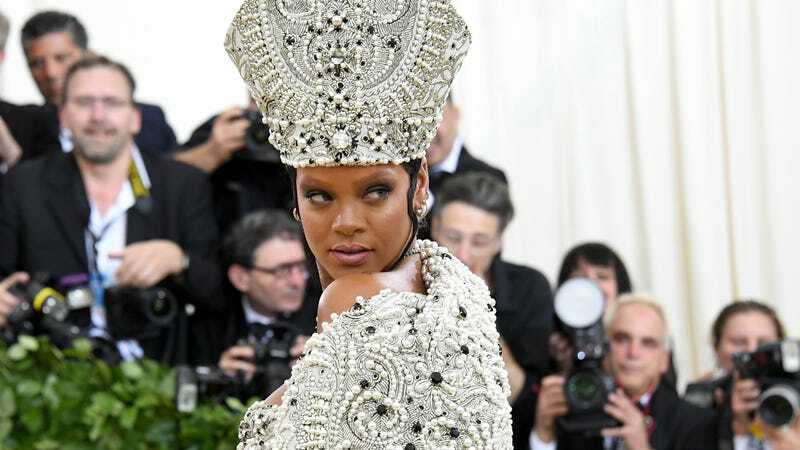 Rihanna attends the Heavenly Bodies: Fashion & The Catholic Imagination Costume Institute Gala at The Metropolitan Museum of Art on May 7, 2018 in New York City. Ready to be dripping in diamonds? As we ready ourselves for cooler temps, Rihanna and Fenty Beauty are preparing to ice you out with the release of two new diamond-themed products for fall, timed to coincide with New York Fashion Week—and Fenty’s first birthday! Riding on the success of Fenty Beauty’s limited edition Diamond Ball-Out Killawatt highlighter benefitting the Clara Lionel Foundation, Rihanna & Co. will be introducing a new highlighter called Diamond Bomb, along with a new shade of her universally flattering Gloss Bomb named Diamond Milk. The Diamond Bomb highlighter is described as a colorless but ultra-sparkly “jelly-powder formula [that] melts into your skin like butter”—an Instragram post likens the “crystal coated sparkle” to a winter-themed Body Lava. Like its predecessor, the pearly Diamond Milk Gloss Bomb is intended to be universally flattering with a peach-vanilla scent and icy glittery finish that can be worn alone or layered over other shades. The new offerings drop on Sept. 7, just ahead of Rihanna’s Savage x Fenty presentation, which will debut their Fall-Winter 2018 collection and close out New York Fashion Week with an “immersive experience” on Sept. 12. No doubt her models’ skin will be shining bright like diamonds as they immerse us further in the Fenty universe.